It’s been more than three decades since I last set foot on Irish soil. I have many fond memories of that visit; however hard as I try, I can’t remember what I ate – although I do remember drinking a fair bit of Guinness. I’m sure I filled up on pub food – good grub but hardly fine dining. 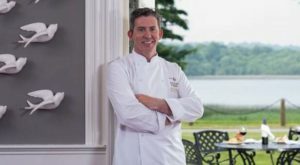 A lot has changed in Ireland since then, including the state culinary affairs, as I learned when I interviewed Noel McMeel, executive chef at Lough Erne Golf Resort and Hotel in Enniskillen. McMeel is a passionate evangelist for what he calls “modern Irish cuisine” – think slow cooking and farm-to-table with an Irish twist. It’s no coincidence that McMeel’s fervor and views echo those of California cuisine pioneer Alice Waters. As a young chef, McMeel worked with Waters at her landmark restaurant Chez Pannise, where the Bay Area chef’s farm-to-table philosophy reinforced his ideas about cooking developed while growing up in Ireland. The young boy was fascinated with the kitchen where he watched and helped his mother can fruits and vegetables and bake all sorts of bread and cakes. “My first attempt at cooking was an orange cake,” McMeel explained, “I mixed it all up and put it in the oven. We had a new oven with a window, so I just stood there watching the magic of the cake rising and becoming something else – it was beautiful. I was so proud of that cake; when I took it out, I told my mother that I wanted to eat it all. She said to me, “it’s your cake son, do what you think is right.” So I ate it all, every last crumb. I had the worst bellyache ever. My mother just smiled at me and told me one of the greatest feelings you can have is from sharing. I got the point — it was a lesson that I remember to this day. Like many great American chefs, he enrolled in home economics class while in public school. Formal training followed at Ballymena Technical College and the Northern Ireland Hotel and Catering College and Belfast Institute. He also honed his skills abroad at the acclaimed Johnson and Wales in Providence, Rhode Island. After learning from the masters at a number of prominent restaurants, including Le Cirque in New York and Chez Pannise in California, the chef returned to Ireland. He earned his chef stripes as head chef at Beech Hill Country House Hotel, Trompets Restaurant, and Castle Leslie. During this time he made regular appearances on televised international cooking shows and contributed recipes and features to Bon Appétit, Food & Wine, and other publications. Pat’s Fermanagh pork products are a perfect example of the locally sourced products McMeel loves, not only because it’s a superior product, but because it has a great story. Pat is Pat O’Doherty who is known as “the Bacon King of Inishcorkish.” He rows his boat every day to Inishcorkish Island where he tends his famous black pigs who happily have the island to themselves to munch its herbs and grass freely. These days, O’Doherty’s pigs are just as famous as the top chefs who feature the “Bacon King’s” products. McMeel is now doing great things as executive chef at the five-star Lough Erne Resort where he works his magic creating his particular brand of modern Irish cooking. At the famous resort, the chef runs three restaurants each featuring a distinctive “Tastes of Lough Erne” including his Catalina Restaurant that earned the coveted Food & Wine Magazine Hotel Restaurant of the Year in 2017.